Fish hobbyists love the harlequin rasbora—it has a beautiful metallic color and it is easy to care for. A large school makes an aquarium vivid and vibrant with movement. This is a great fish for a smaller-sized community tank, and its at peace with most. It is a smaller fish, so keep it with like-sized fish. Larger fish might be attracted by its shimmer and make a meal out of it. Rasbora espei, R. hengeli, and R. heteromorpha. The harlequin rasbora is a native of Malaysia, Singapore, Sumatra, and southern Thailand. It inhabits streams and waters that are characterized principally by low mineral content, high concentrations of dissolved humic acids, which is typical of water found flowing through peat swamp forests. The waterlogged soils of these forests inhibit the complete decay of leaf litter and result in the formation of peat, which leaches humic acids. These conditions resemble those found on in the blackwater habitats of South America. Of the more than five dozen species of rasbora, the harlequin is arguably the most popular of them all. Often referred to as a red rasbora, the body is a reddish copper color which is accented by a striking black wedge covering the rear half of the body, like a characteristic black "pork chop" shaped patch. The distinguishing triangular patch begins near the dorsal fin and comes to a point near the base of the caudal fin. These species look a lot like Rasbora espei and R. hengeli. The harlequin rasbora is a shoaling fish, it should be kept in schools of 8 to 10 individuals. Since the fish is rather peaceful, it makes a good community fish. Schools of larger numbers make for a beautiful display. You can keep it with any fish as long it’s not large and a predator. It will not nip at or quarrel with any other species. Some potentially good tankmates may include cardinal tetras, neon tetras, dwarf gouramis, bettas, small barbs, danios, other small rasboras, and cory catfish. Rasboras are a true freshwater fish and are never seen in brackish waters. They prefer the lowland waters of southeastern Asia, where the water is soft and acidic. Harlequins prefer an environment with areas of dense vegetation, an open area for swimming, a dark substrate, and subdued lighting. Water temperature is not critical, however, the ideal range is 74 to 78 F (23 to 26 C). The pH of the water should be slightly acidic, in the range of 6.0 to 6.5. An aquarium intended to house harlequin rasboras should be planted with live plants, with some open areas for swimming provided between stands of plants such as Cryptocoryne species, these being among the plants that inhabit the harlequin rasbora's native waters. Harlequins make excellent community fish and will not nip at or quarrel with any other species. Rasboras are undemanding when it comes to diet; they will readily accept flake, dried, frozen and live foods. A varied diet will ensure that digestive problems or susceptibility to disease do not occur. Males are more slender than females and exhibit a rounded extension at the bottom edge of the distinctive black wedge covering the posterior of the fish. The black wedge on females is perfectly straight. The female Harlequin Rasbora is also larger than the male. Harlequins are among the more difficult species to breed, however, spawning may be achieved if you provide the proper conditions. Select young specimens and condition them with live foods such as daphnia and mosquito larvae prior to the spawning attempt. 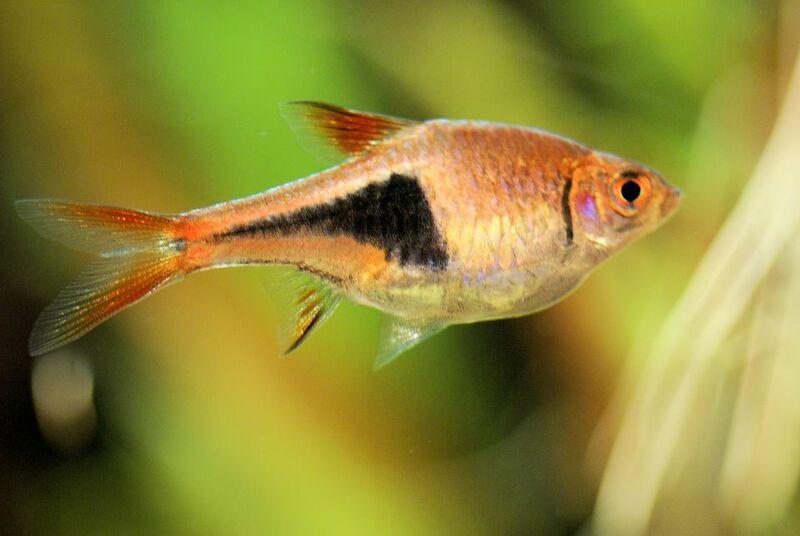 Harlequin rasbora differ from other popular rasboras in the aquarium when it comes to breeding. While other rasboras are egg-scattering spawners, harlequin rasboras are egg layers. You can breed groups of young harlequins in a single aquarium. When spawned in groups, keep two males for every female. Hobbyists intent upon simulating natural conditions as closely as possible may choose to filter the aquarium water over peat, thus replicating the humic acid concentrations found in the fish's native waters, though this is not absolutely necessary if the basic water chemistry parameters (no higher than 4 dH hardness, pH around 6.4) are correctly maintained. Optimum water temperatures are between 76 and 80 degrees F. You will need Cryptocorynes or similar broad-leafed plants in the breeding tank. Once you prepare the breeding tank, introduce the breeding stock late in the day. Spawning will usually being in the morning and is initiated by the male dancing and trembling before the female. This spawning behavior is intended to direct the female beneath a suitable plant for depositing the eggs. You may see the male nudging the sides of the female and rubbing his belly against her back in an effort to move her to the spawning location. When ready to spawn, the female will turn upside down and rub her belly against the underside of a leaf, signaling the male to join her. The male will approach her while continuing to tremble, then wrap himself around her body and fertilize the eggs as they are released. Six to 12 eggs are laid at a time. The fertilized eggs rise and adhere to the underside of the leaves. Over the course of one to two hours, as many as 300 eggs may be laid. Although, 80 to 100 is more typical. When spawning is complete, remove the breeding stock from the aquarium, as they will consume the fry once they hatch. In water temperatures of about 80 degrees F, the eggs will hatch in approximately 24 hours. The fry is translucent, remain attached to the leaf upon which the eggs were laid for another 12 to 24 hours, during which time the yolk sac is absorbed. Once this process is completed, the fishes become free-swimming, and at this stage, require very finely sized food such as live infusoria for a period of seven to 14 days, after which the fry are able to feed upon newly hatched brine shrimp. If infusoria are unavailable, commercially prepared foods for an egglayer fry may also be used. Young harlequin rasboras reach sexual maturity in approximately six to nine months.